I recently worked on an engagement where the requirement was to process excel spreadsheets sent to a group mailbox hosted in an on prem exchange server. The excel sheets were based on a standard template and had a reasonable enough level of validation to support data quality with loading into a mart. The interesting part of the engagement was building a custom task to process the emails and attachments sent to the group mail box. The choices for this solution were either a 3rd party tool or script task. The client didn’t want to purchase a 3rd party tool…so time to get my C# on. Schedule the task to run at your desired interval. It will query the mailbox to find all emails with the attached file type, download the attachments to the output directory, and then delete the email(s). Why would we want to implement this in DAX? 1) I implemented XOR to ensure that only one table was being filtered from among a group of role playing dimension tables. This adds some validation around returning data to users when they may be using conflicting filter values. 2) The implementation is fairly straightforward. For any logical expression, we can implement a true/false condition, then return a value if only one condition is true. I have a series of snapshot date filter tables for end of period values that all relate to a single snapshot fact table. The end date values in the filter tables are for week, month, and year for both Calendar and Fiscal period, for a total of six role playing tables (albeit with not exactly the same data, but some intersecting values). I want to remove the chance of rendering any values when more then one snapshot date is being filtered against facts by any of these tables. So, first we create a few intermediate measures to implement our conditions. In our specific case, I want to make sure only one of the role playing snapshot tables is filtered to a single date. 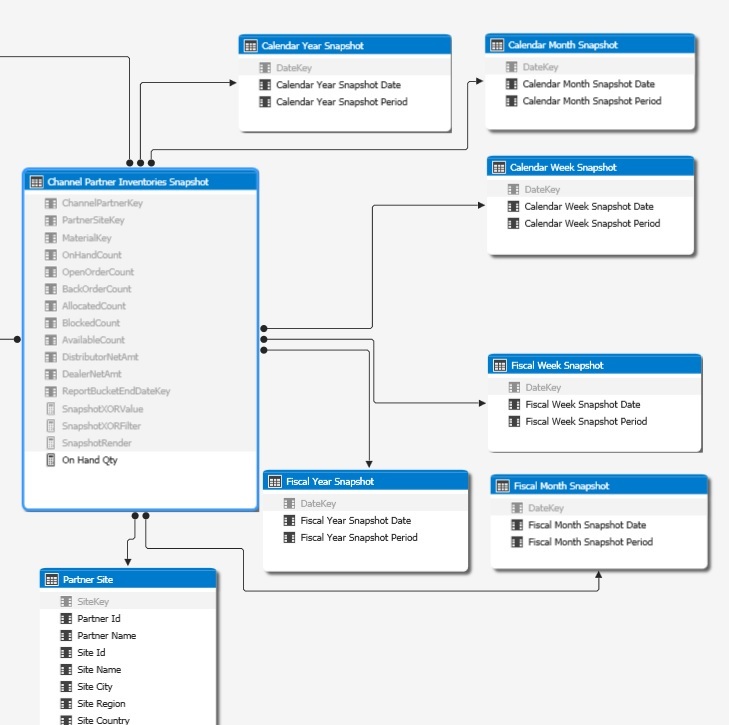 There’s been an excellent free solution for documenting SSAS metadata in multi-dimensional models for quite some time: http://www.purplefrogsystems.com/blog/2010/09/olap-cube-documentation-in-ssrs-part-1/. Please try it out and let me know how it works for you. A huge thank you to Alex Whittles for the vast bulk of this base code! 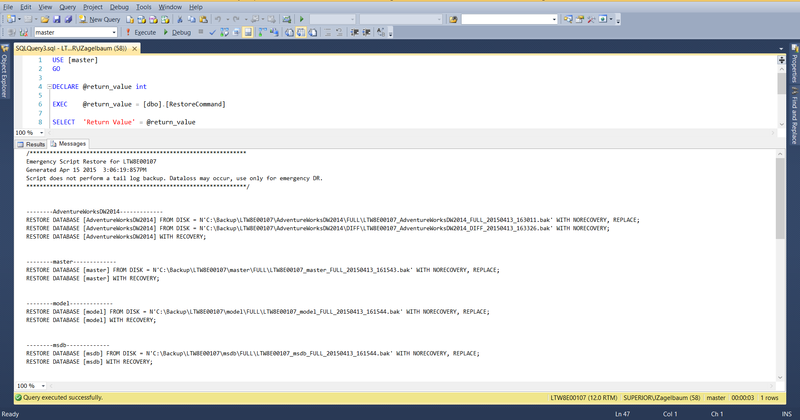 I developed the T-SQL based on the code blocks created when you script a job directly through SQL Server Management Studio (SSMS), which also follows the required steps as outlined here: https://technet.microsoft.com/en-us/library/ms181153(v=sql.105).aspx (which, for some reason, Microsoft only references through version 2008 R2). Run the script against the instance that you want to copy the jobs and schedules from. The short take away is that the script is designed to be executed against a target instance that does not have jobs or schedules with the same names as the source instance. If there are identical names, make sure that the definitions are identical as well prior to running the script against the target. I’m also assuming that all jobs are local. All jobs and schedules will be created with ‘sa’ as owner. If that doesn’t work for you, then you’ll have to do some modifications to the script. Run the script against the instance that you want to copy the jobs and schedules from. The short take away is that the script is designed to be executed against a target instance that does not have jobs or schedules with the same names as the source instance. If there are identical names, make sure that the definitions are identical as well prior to running the script against the target. I'm also assuming that all jobs are local. Create the appropriate SQL Agent operator on the target instance. The script will only set the operator based on the default you provide (set as "DBAdmins" by default). All jobs and schedules will be created with "sa" as owner. If that doesn't work for you, then you'll have to do some modifications to the script. AlwaysOn availability groups are a powerful enhancement to SQLServer HA, and offer many improvements over older database synchronization techniques like mirroring and log shipping. However, there is also additional complexity involved in implementing this technology, and one of the stickiest areas for database administrators is having to deal with non-contained objects, or objects that exist at the instance level, but not the database level (logins vs users, as an example). For new development, contained vs. uncontained objects can be accounted for and considered during application design. But what about those existing mission critical legacy applications that we want to benefit from AlwaysOn? Those are, undoubtedly, the instances that would benefit from automated failover and read / write workload balancing the most! Well, fortunately these older implementations can be modified to work seamlessly with AlwaysOn, but the instances they run on will most likely need some intelligent customization. Here’s one situation you might encounter: legacy applications using SQL Agent jobs to update data on a schedule. In SQL Server AlwaysOn, all system level objects are non-synchronized, including SQL Agent. The assumption is that all applications need only database level objects to function, and that system level objects are only required for maintenance and administration of the instance. I had a client with a legacy mission critical application that they wanted to implement with AlwaysOn. This application relied and several SQL agent jobs to update data on a scheduled basis in order to maintain application integrity. Less then optimal, I know, but that’s what you get with legacy. The blocker with this implementation is that the jobs would fail if executed on a secondary replica, because the primary is the only write enabled replica. So, how do we customize AlwaysOn replicas to ensure that these agent jobs are always and only running on the primary replica? The solution I implemented is composed of four parts: A system function, a user stored procedure, a SQL Agent job, and a SQL Agent alert. The key to this implementation is ensuring that all of the jobs you need to manage are maintained in their own user defined category(s). Microsoft provides us with a handy-dandy little system function: sys.fn_hadr_is_primary_replica. This function accepts one parameter, @dbname sysname, the name of a synchronized database, and “returns 1 if the current instance is primary replica; otherwise returns 0.” This is what we’ll use in our procedure to determine whether to enable or disable the read/write SQL Agent jobs. Having fun yet!? Now we can add this s proc to a job. Here’s a script that will create the job for you using the much preferred CmdExec method (assuming you create [dbo]. 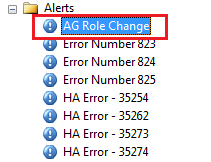 [JobChange_AGFailover] in master). Make sure you update the supplied values where noted. Alright, we now have an automated way of enabling and disabling read / write SQL Agent jobs based on whether the replica role is primary or secondary. The alert will be raised whenever a failover occurs. If, for some reason the alert does not trigger successfully (I’ve not encountered this), you can always start the job manually on the affected replica as well. The final result that we want is that SQL jobs that edit data are disabled on secondary replicas and enabled only on the primary by job category. Multiple jobs and alerts can be added for different databases and/ or categories. You can view the enabled property value easily under Job Activity Monitor in SQL Server Agent. There’s numerous blogs and presentations out there about Ola’s Maintenance Solution. I don’t feel a strong need to try to replicate that information here. What I am presenting is a custom extension that works out of the box for those of you that have created jobs using the maintenance solution. 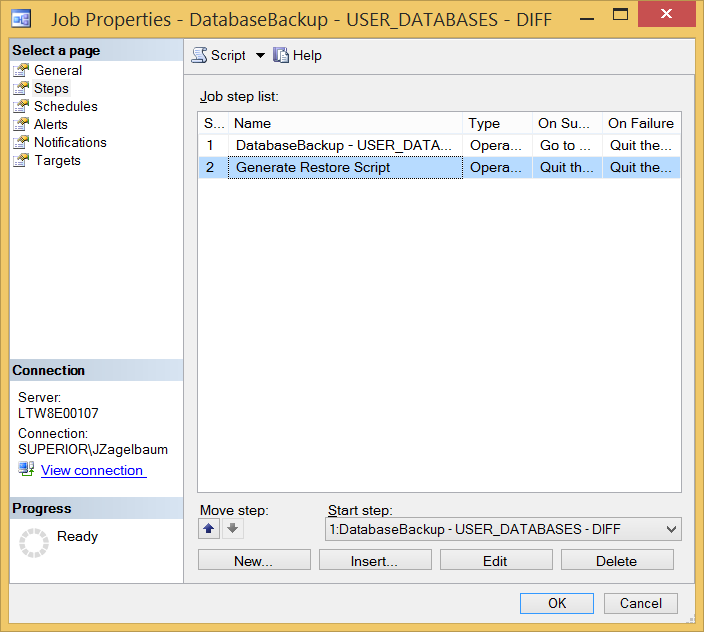 The scripts will add an additional job step to all DatabaseBackup jobs which will output a continuously updated text file that contains the most current restore scripts for each database in the instance. Let’s just get to it then, shall we? 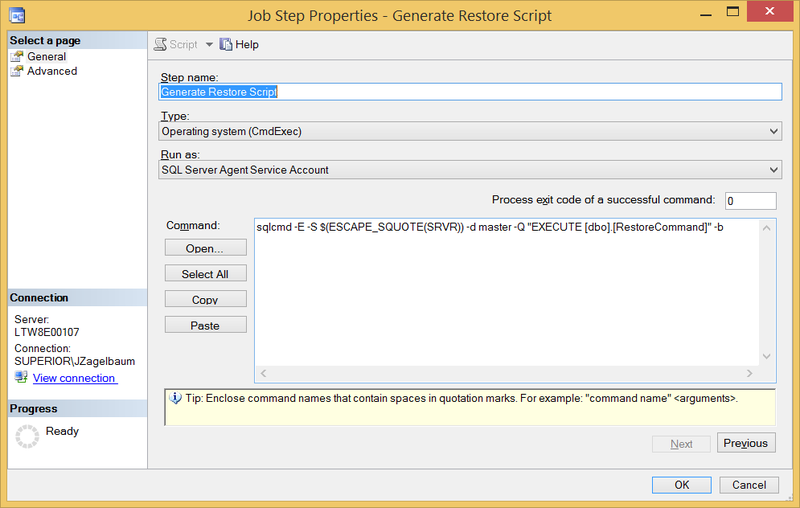 SQL Server agent should have read / write access to the directory where the restore scripts will be written. The default is the @Directory value. If you don’t know what @LogToTable, CommandLog, and @Directory are, then please read up on Maintenance Solution before continuing. 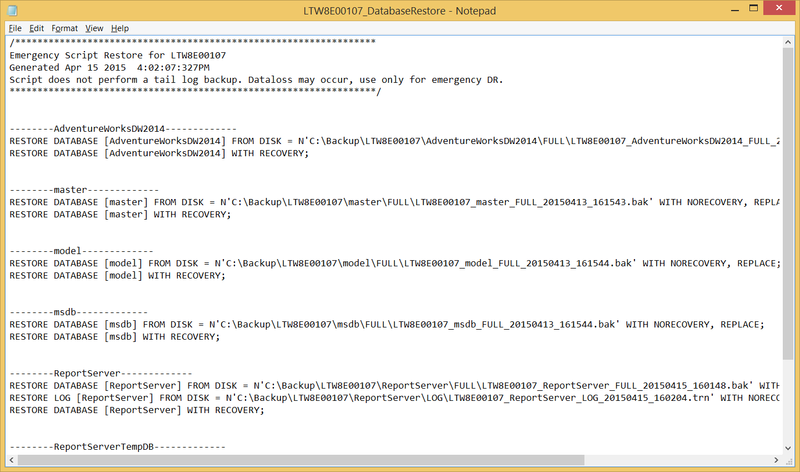 @RestoreScriptDir, accepts ‘Backup_Dir’, ‘Error_Log’, or custom defined dir, e.g., ‘C:\’. If the dir is a custom value, the directory must be created prior to running the job. For the @RestoreScriptDir parameter, the default value ‘Backup_Dir’ places the script in the instance level folder in the directory of the backup files, which is determined by the value of the @Directory parameter. 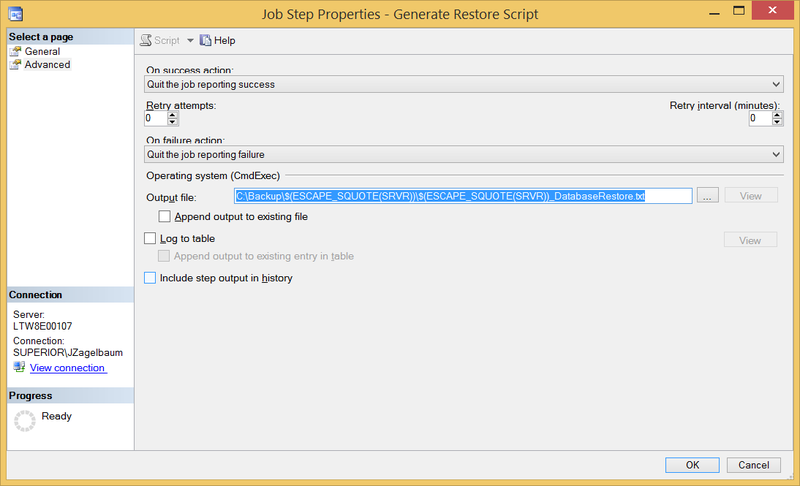 ‘Error_Log’ places the restore script in the same dir as the default location of Maintenance Solution output files. Make sure SQL Agent has read / write access to any custom directory if used. So, you now have the power to restore your instance at the database level up to the last verified, completed backup. No GUI, no guesswork, and most importantly, no trying to figure out what needs to be restored when you have the least amount of time to think about it. I recently worked on a project where the client requested to “remove all of the unused jobs” that had been installed across their production instances over time. I originally thought that using the enabled property would lead me to the right jobs, but as that is user dependent, and the fact that users created the mess in the first place, that didn’t end up being the best way to thin out the herd. DAX offers many powerful time intelligence functions that can be applied at virtually any level of a date / time hierarchy. There are also custom patterns available that can be implemented for week based and ISO 8601 calendars that will emulate the same functionality (case in point, see Time Patterns articles on DaxPatterns.com as well as other articles on SQLBI.com). An issue that arises with the implementation of time intelligence in DAX, however, is that the default behavior is to create a new metadata entry for every measure created in the model. This behavior can quickly propagate your cube metadata into something confusing and error prone to users. Note: QTD and MTD would use the same calculation with the exception of replacing TOTALYTD in the DAX formulas with TOTALQTD and TOTALMTD, respectively. 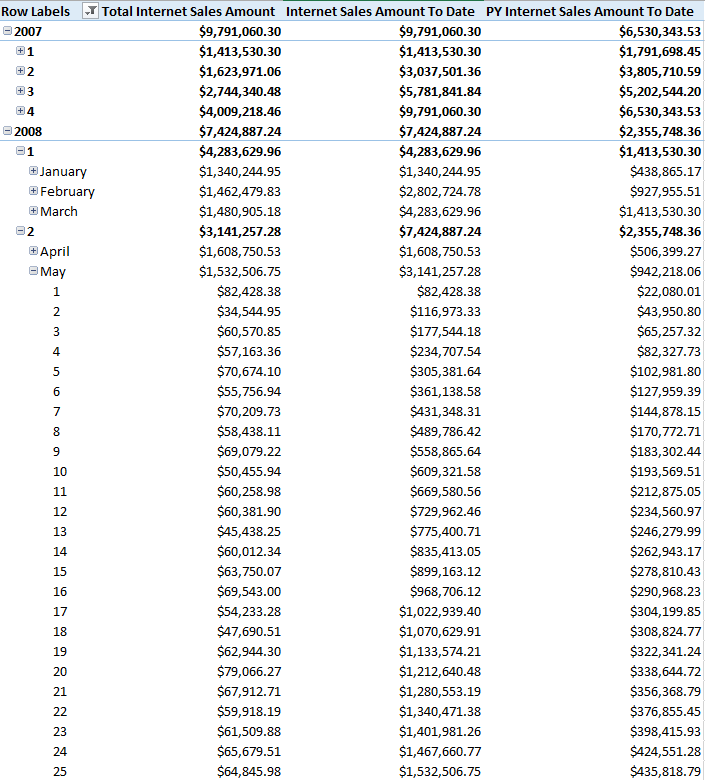 Notice how MTD amounts incorrectly render at the quarter and year levels of the date hierarchy. Likewise for QTD at the year level as well. These issues are also repeated for the PY measures. The “quick and dirty” solution to this problem would be to hide any values for *TD measures where an inappropriate date attribute is used in the pivot / report. This would eliminate the risk for errors in reports (or, more likely, the risk of the developer losing all credibility). However, there still remains a major unresolved issue with this approach: Every corresponding measure for which there is a *TD requirement would have metadata in triplicate. Users would have to remember to select MTD, QTD, or YTD versions of each measure from the model depending on which time intelligence function was desired for reporting. Likewise, a report with drilldown on the date hierarchy would basically end up being dumped to a spreadmart, or become a developer created / assisted task as the ad hoc layout of such a report from the cube would be 3x larger then necessary. 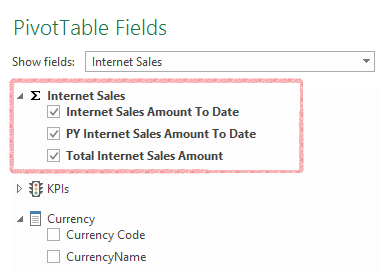 The Internet Sales Amount To Date and corresponding PY measures now show only the required cumulative totals at the appropriate level of the date hierarchy. Here it is MTD at day level, QTD at month, and YTD elsewhere. This can be easily changed to meet different requirements purely in the Switch() function. The DAX implementation of time series metadata is still not as nicely abstracted as Multidimensional yet, but there are alot of tools you can use to simplify tabular models to meet most user requirements. Hope this helps! The key to this extremely cryptic puzzle was to add the “/_vti_bin”. Not easy to find if you are hunting online. Not too long ago I had a client with a very simple, yet practical requirement: they wanted all of their SSRS reports to have standard headers and footers. Nothing ground breaking there, however, the twist that they put on this requirement was a very useful one in that they wanted to use a single template file to apply the headers and footers. Even more, they wanted this template to be easily updatable, meaning any update to the template would apply the changes to all reports simultaneously. Ah, now we’re on to something more interesting. In the past, I have only used the rs Utility for scripting deployments and backups; but, why not use it to update report definitions? It already exposes the necessary web service method: SetItemDefinition. The implementation is actually fairly straight forward (after I racked my brain for a couple of days). As I said before, the original solution ran within a custom app that implemented LocalReport. We simply updated the appropriate .rdlc XML elements at run time against the defined template document. Transposing to the full report server, we just need to identify the template document on the server, then apply the appropriate XML elements to all of the report files in a loop instead. A couple of things to be aware of about your template and report .rdl files. I suggest naming each report item in the header like “CustomHeaderImageLeft20141114”. 2) Don’t use an embedded image in your template file. This is because the script just won’t work If you do, but also, if you’re applying the image to all of your report definitions then you’re better off using an external reference image anyways. The image itself can just be uploaded to your report server.
' 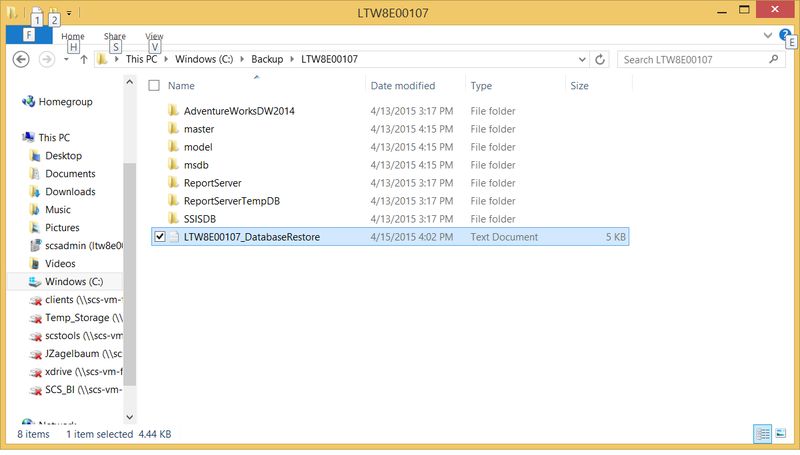 Save file as .rss extension and run using rs.exe from command line. 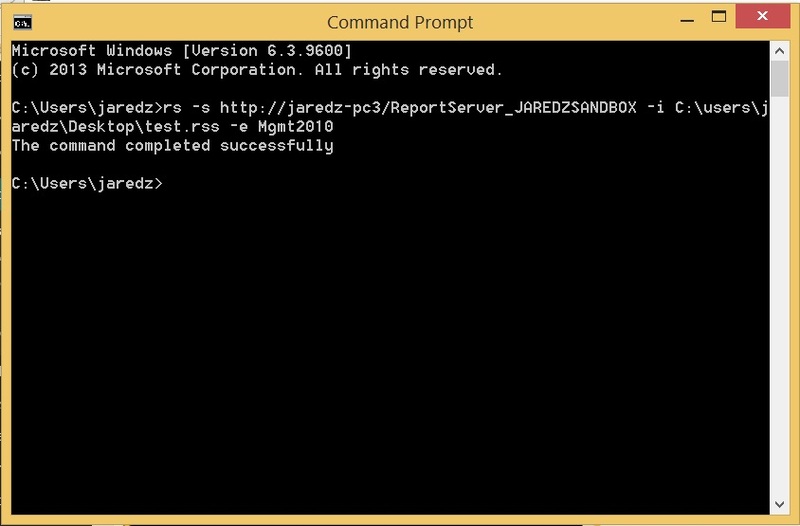 Save this script using .rss extension and execute from the command line on your reportserver from any directory. The great part about coding against the Mgmt2010 endpoint is that the script can run against stand alone or integrated SharePoint mode without change. However, If you have an older version of SSRS, then you will have to alter the name space reference and xpath to the appropriate version / schema. There may / may not be different API calls involved as well. One could get even more detailed with this script and add common items to anywhere in a report; datasets, etc. In those cases, it would also be better to create a reference to a shared dataset instead of scripting a new one into every single report. I originally said that we were teaching SSRS a new trick, but the API / rs.exe utility has been around for several years now. Just like training a dog, most of the work is what the human has to learn. Hope this helped!